Coming soon to a mobile phone near you: ringtones that enhance brain functioning. TOS (website), an ultra-cool Japanese company rolling out mobile lifestyle technology, has added Kiseki-no Chaku-uta (Wondrous Ringtones) to its well-known “Maho no Melo-land” (Magic Melody Land) library of ring-tones. 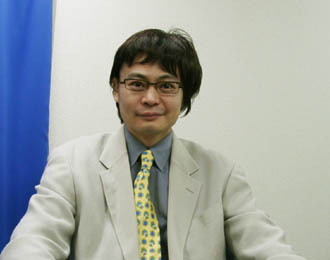 These ring-tones are specially designed by Dr. Hideto Tomabechi (picture), a Japanese with a Yale Ph.D who later studied machine translation and has now morphed into an all-round very digital guy (see his Japanese-language blog). Specified programs were used to create these sound tracks with several psychological experimental results of Dr. Tomabechi. It is programmed to get the expected effect by listening to those sounds over and over everyday. If we complete our theory of neurotheology, then we will definitely publish ringtones which make you feel closer to God every time you hear them. This entry was posted on Monday, January 3rd, 2005 at 23:13	and is filed under music. You can follow any responses to this entry through the RSS 2.0 feed. You can leave a response, or trackback from your own site. I am curious about this technology. Is there a functional sound that will help me to lose weight? can you conferm the teori of brown noise? i would be very happy,an i think that many people will be very happy if Dr. Hideto Tomabechi could create a ringtone for giving up somking!If there is such a ringtone pls contact me!